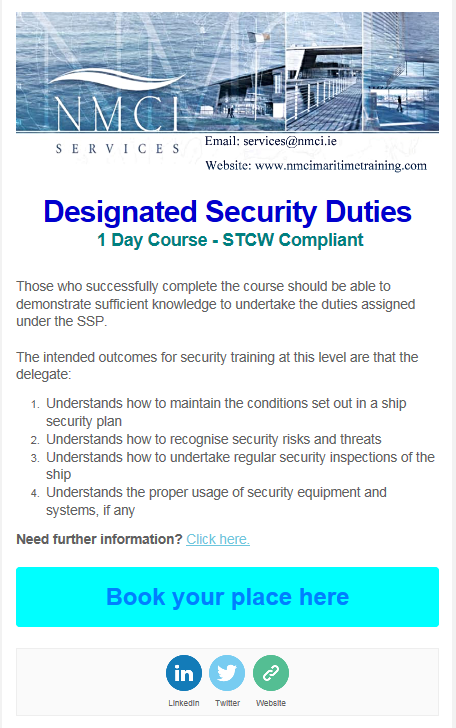 NMCI Services will be running a Designated Security Duties Course on May 11th at the National Maritime College of Ireland in Ringaskiddy. This course is STCW Compliant and runs over the course of 1 day. Delegates are advised that spaces are limited and we would recommend booking early. You can book your place by clicking here. Our location is what sets us apart from our competitors. With great connectivity to Europe we are an ideal location for delegates from Ireland, the U.K. and further afield. With no VAT on training on Ireland why not let NMCI Services be your first port of call for all your training needs. Want further information on who we are? Why not check out our website here, or even have a look at some testimonials from delegates who have completed courses with us before. Just in case you still want some more information then why not give us a call on +353 21 4335609. It is intended that those attending this course will be serving seafarers that are likely to be designated with security duties in connection with the Ship Security Plan. Serving seafarers in this case would be currently serving at sea, or persons who would have their qualifications other than security training ‘in-date’.